The Lacrosse Adamas HD was designed for workers who demand the ultimate in toughness and comfort. 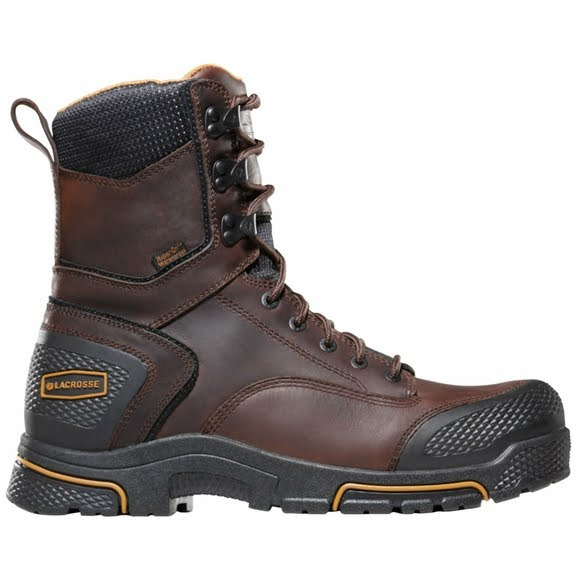 These waterproof, slip-resistant boots are wrapped in thick full-grain leather. They also feature diamond-plated protective rubber panels on the toe and heel. Inside, the Adamas offers remarkable comfort thanks to four layers of cushioning and LaCrosse Dry-Core liners. 30 Day Comfort Guarantee: we guarantee the comfort and support of our Quad technology. Love it for 30 days or your money back. Dry-Core lining is a highly engineered, waterproof, scent-free barrier that lines the entire boot for 100% protection. Not only does Dry-Core block water from entering the boot, it also absorbs moisture in the boot and transfers it away from your foot. Featuring four layers of comfort for day long wear and reduced foot fatigue. A Quad-Core insole board with EVA foam filled cutouts that cushion key weight bearing points of the foot.